The Google Pixel has been available in three colors - Very Silver, Quite Black, and the Limited Edition Really Blue. When the Really Blue model was sold out within hours of the Pixel's release, many worried it would not be re-stocked. Google confirmed to us last month that the color would eventually be available again, and now the day has come. 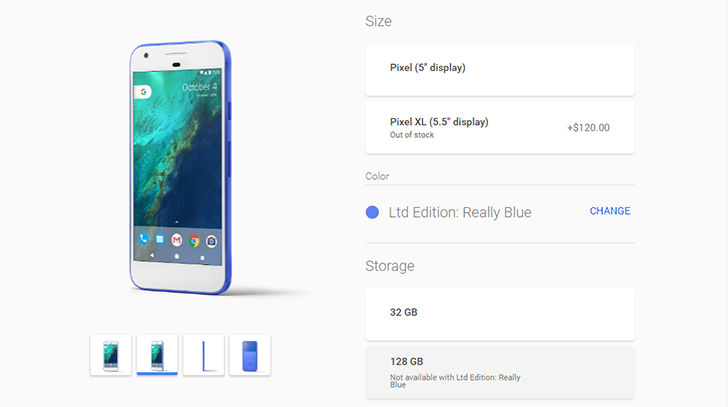 Unfortunately, only the 32GB 5" Pixel is available in the Really Blue color. The 128GB 5" Pixel or any of the Pixel XL models don't have Really Blue as an option. The color does not appear at all when purchasing a Pixel through Project Fi, but all Pixel phones (even Verizon-sold models) work just fine on Project Fi anyways. The lack of additional models in Really Blue is a bit of a bummer, but it's there if you want it. And yes, it is still $649.